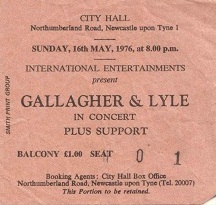 The last time I saw Gallagher in Lyle in concert was in 1979 at Newcastle City Hall. 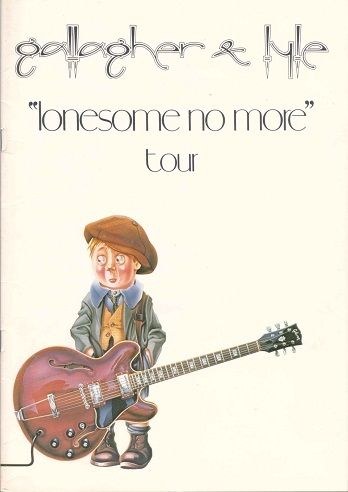 This was the “Lonesome No More” tour, and the band were supported by Judie Tzuke. Lonesome No More was Gallagher and Lyle’s eight studio album, and was to be their last. Certainly for me there was much more of a buzz around the up and coming special guest star in the making Judie Tzuke than the headlining duo. In fact Gallagher and Lyle split shortly after this tour. Interestingly Judie’s band of the time consisted of Mike Paxman (now Status Quo producer), John (Rhino) Edward (current Status Quo bass player) and Jeff Rich (former Quo drummer). Some pretty heavy Quo connections there! This was at the time of her debut album Welcome to the Cruise, which contained the hit single, Stay with me to Dawn. The hall was packed for her performance, which wasn’t often seen for a support act, as punters (including me) would usually frequent the bar until the main act took to the stage. Judie was just exquisite; Welcome to the Cruise contains some beautiful songs, and she was soon back at the City Hall as a headliner in her own right. Gallagher and Lyle went their own ways after this album and tour. They reformed last year for a few gigs in Scotland; if they play again this year I should try and get along to see them, particularly if they venture south of the border. Does this one rate as a guilty pleasure? It certainly is closer to easy listening than heavy or classic rock. Gallagher & Lyle came out of the Scottish music scene with connections to Marmalade, and were members of McGuinness Flint, before going solo and having their own hits in the early 1970s. They also spent a short period as members of Ronnie Lane’s Slim Chance. They recorded a series of hits including I Wanna Stay With You, Heart On My Sleeve and Breakaway, and had some great songs, all of which featured in their concerts. I also recall them playing When I’m Dead and Gone. Gallagher and Lyle in concert guaranteed a night of good music. 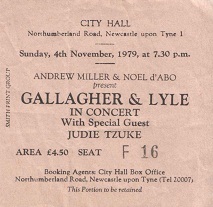 The tickets here are from gigs in 1976 and 1977 at Newcastle City Hall, and the programme is from the 1977 concert. The support act for the 1976 concert was Chris De Burgh. 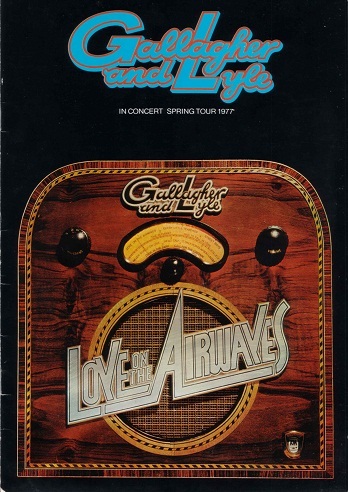 The programme tells me that the 1977 tour was in support of the Love on the Airwaves album, which was their sixth lp, and followed the massive success of the Breakaway album which stayed in the album chart for 35 weeks, and spawned three hit singles. Support for the 1977 gig was a band called Cado Bell, who hailed from Glasgow. Looking at the programme, I see that the lead singer was Maggie Reilly, who went on to sing Moonlight Shadow with Mike Oldfield. I often learn something each time I reflect on one of these gigs from the past; I wasn’t aware that I had seen Maggie Reilly, although having said that I may have seen her with Mike Oldfield. As well as these gigs I saw Ronnie Lane’s Passing Show tour, and Gallagher and Lyle were members of the band at that time. I also saw them as support acts for other artists. 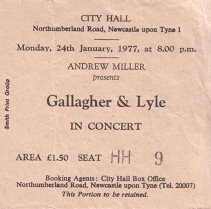 I saw Gallagher and Lyle once more in concert in 1979, again at Newcastle City Hall. I’ll reflect on that gig tomorrow.